LeapFrog ® educational toys have been some of the most entertaining and fun toys that my children have played with since they were babies. 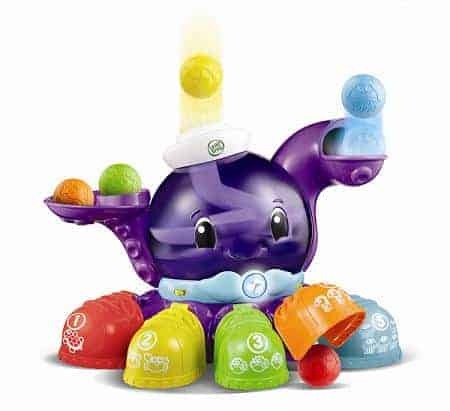 This Holiday season, the LeapFrog® Peek-A-Shoe™ Talking Octopus is sure to delight babies and toddlers with an exciting ball drop, captivating colors and music. In my opinion, the LeapFrog® Peek-A-Shoe™ Talking Octopus is a wonderful addition to the LeapFrog® selection of learning toys. This 2011 winner of the Oppenheim Toy Portfolio Platinum Award would make an excellent gift idea for children ages 9-36 months and is available for purchase at retailers nationwide and online for the MSRP of $39.99. You are invited to visit the LeapFrog® website to learn more about the Peek-A-Shoe™ Talking Octopus.